Preheat oven to 350 F. Roll out pie crust for bottom shell and bake 5 min (in a deep-dish pie pan). Remove from oven and use some egg white to thinly coat the bottom of the crust. Put back in the oven for about 5 min. more (you don’t want it to be completely done, just partially – the egg white is to seal the bottom crust so it doesn’t get soggy – yuck). Put the prepared strawberries and rhubarb into a large deep pot or pan. Add sugar and stir gently. When juices start coming out, heat on very low. When there is an actual syrup (a few min.) add the flour and nutmeg and turn off the heat. Stir until blended, then add the eggs (if you had let it get to boiling, don’t add the eggs til it’s cooled off, you don’t want them to curdle – and if you did boil, then definitely lower the baking time). Pour the slightly cooked fruit filling into the slightly cooked pie crust. Cover with lattice (what I recommend) pie crust. You can put some dabs of butter on if you like, I didn’t. Bake at 350 F for 30-50 min – take it out when the top crust is browned. 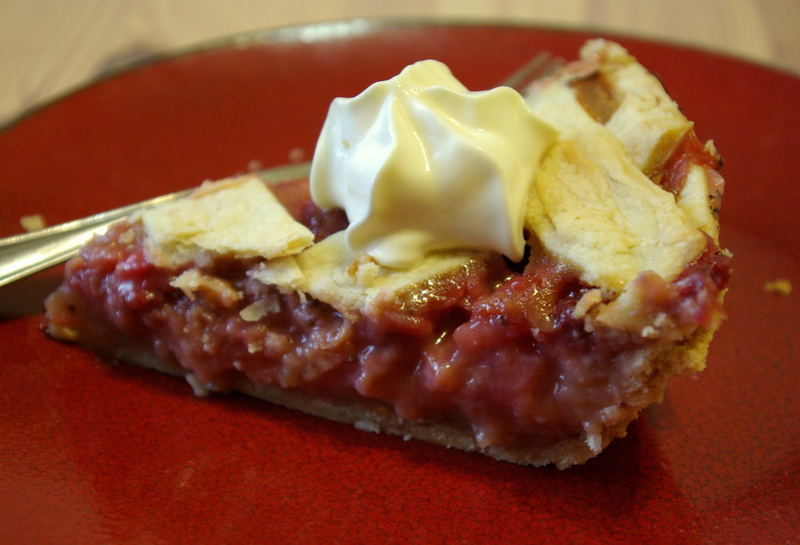 Allow the pie to cool several hours, or the next day, then slice and enjoy! Make the pie filling just like described above. Put into a square or rectangular baking dish. 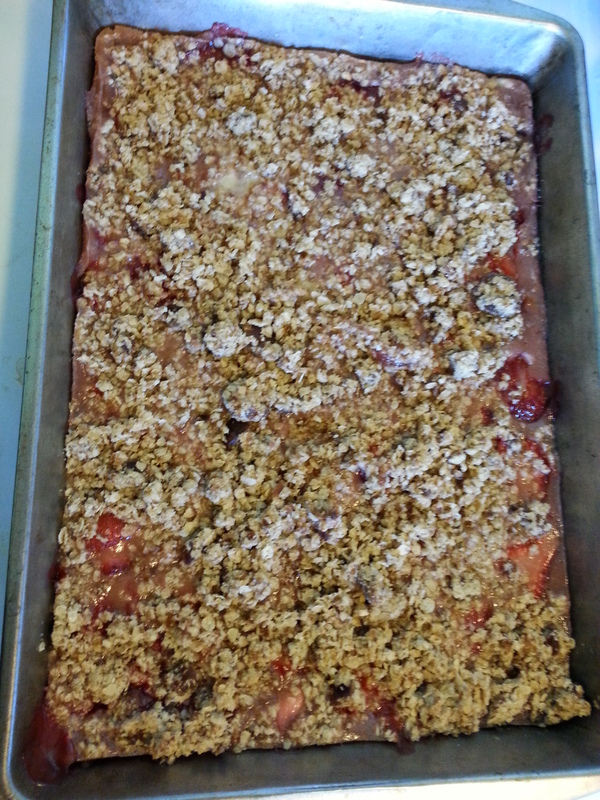 Top with a standard crumble topping. This is what I did, approximately, for the crumble in the picture. This sounds really good, Kathy, I definitely am going to try this–will let you know how it turns out for me. Your picture looked so good, too. Hope all is going well for all of the family, especially you! How are YOU doing? Greet the family from us.